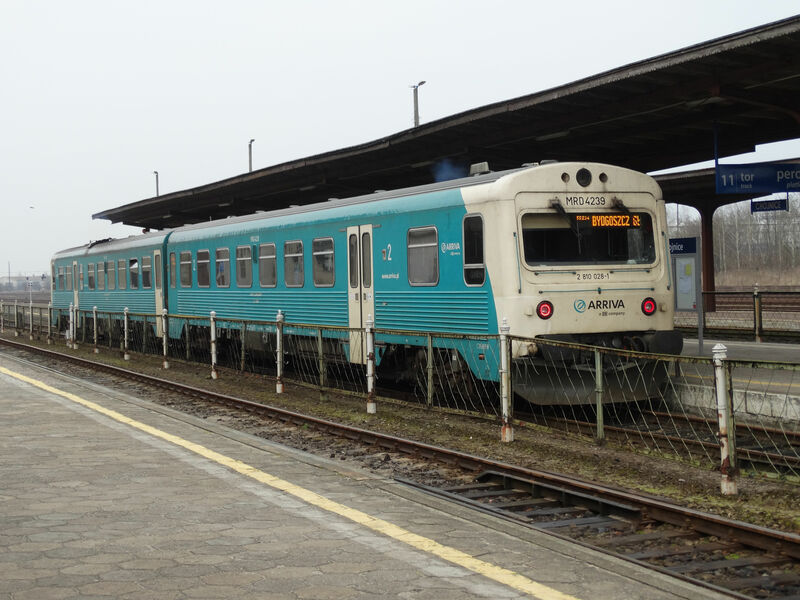 A three coach diesel railbus of the class SA138 is waiting here at the station of Rybnik for its next departure. Koleje Śląskie is a new company. It was founded in 2010 and started operations in 2011. 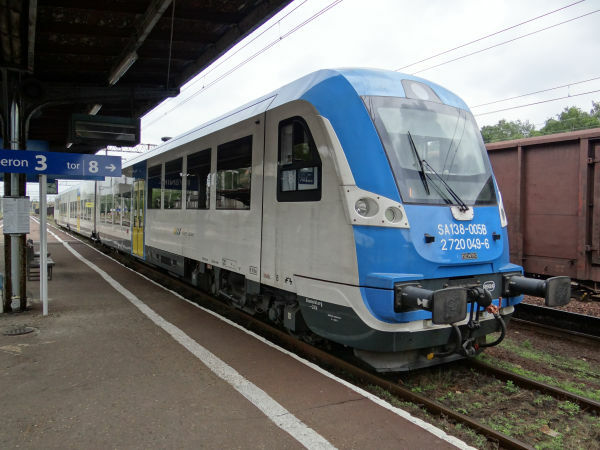 Earlier train services were bought from the state railways PKP Polregio, but since the Silesian government wasn't happy with the service they got, they started their own company. The beginnings were difficult, with not enough and not good enough trains available. Koleje Śląskie started by buying second hand trains from where ever they could, for example from Holland, but they also got some brand new ones such as this one. 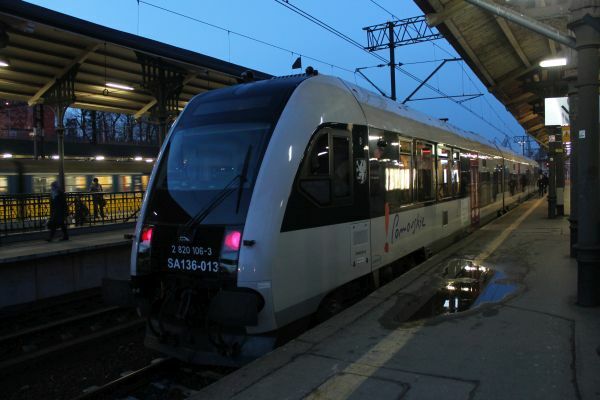 The model SA 138 was built by Newag since 2012 as their type 221M. Koleje Śląskie got five of them. Picture from Rybnik station in Silesia 29.6.2015 by Ilkka Siissalo. Another view of the same Newag SA138 diesel multiple unit of Koleje Śląskie. In the old German province of Pomerania, Pommern, Arriva is the train operator. And Arriva is a daugter company of the German state railways DB, so the Germans in a way still have a hold of their old train lines. 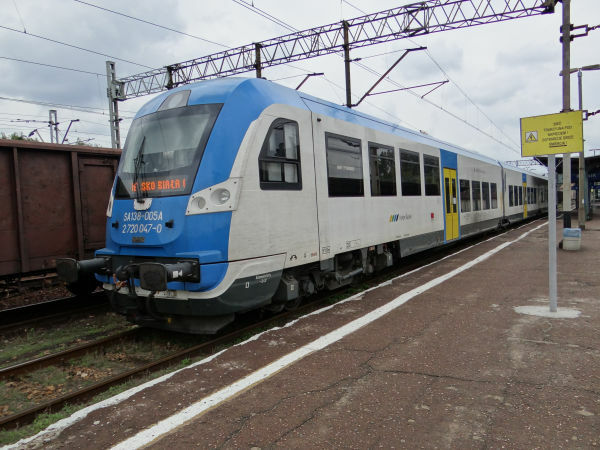 This is a class SA106 railbus, which is made by Pesa as their type 214M. Picture from Czersk 5.4.2017 by Ilkka Siissalo. 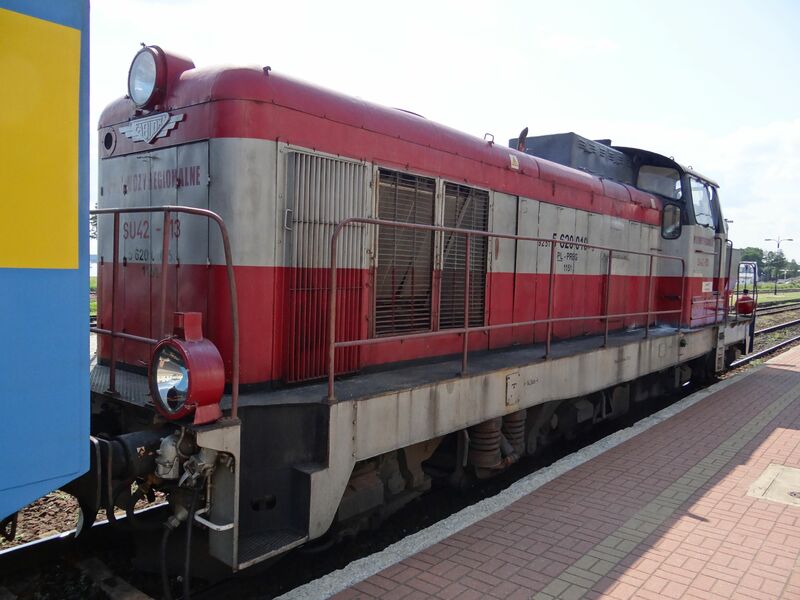 This train was a surprise to find in Poland. It is a Danish class MRD railbus, still with its Danish registration texts. 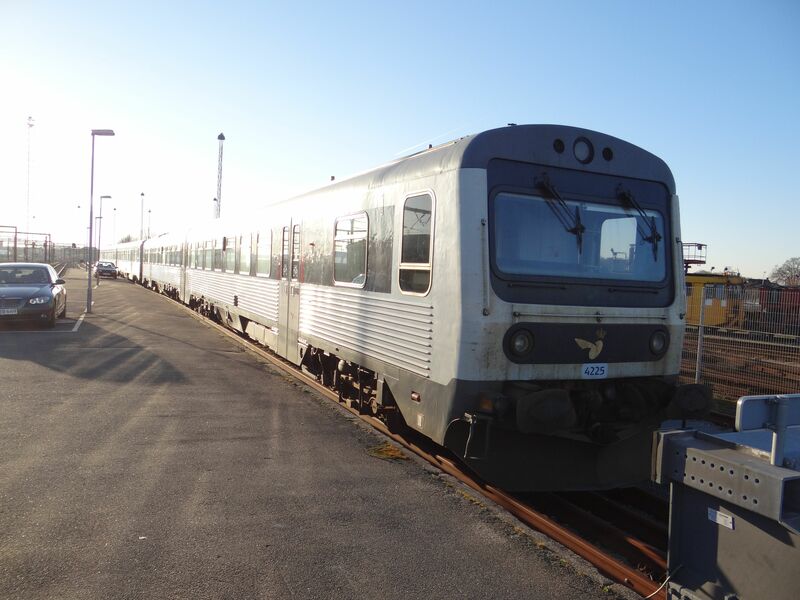 DB Arriva won some years back in a public tendering most of the regional train traffic of Jutland in Denmark from the Danish state railways DSB. 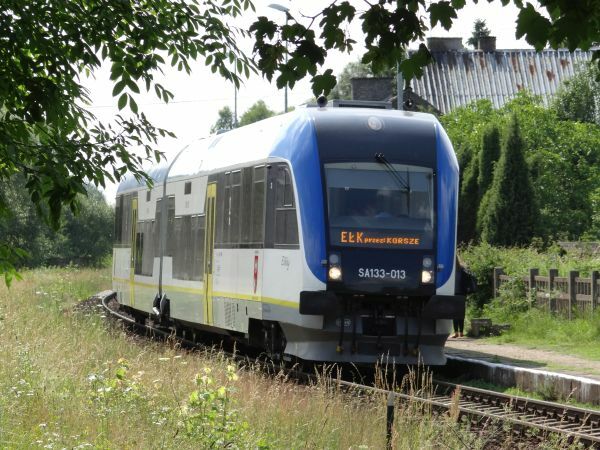 Arriva ordered new Alstom Lint trains for the traffic, but before it got them, it had to overtake from DSB some of the very old DSB class MRD railbuses that for years and years had circulated in Jutland. Arriva repainted them in their greenish house colours. 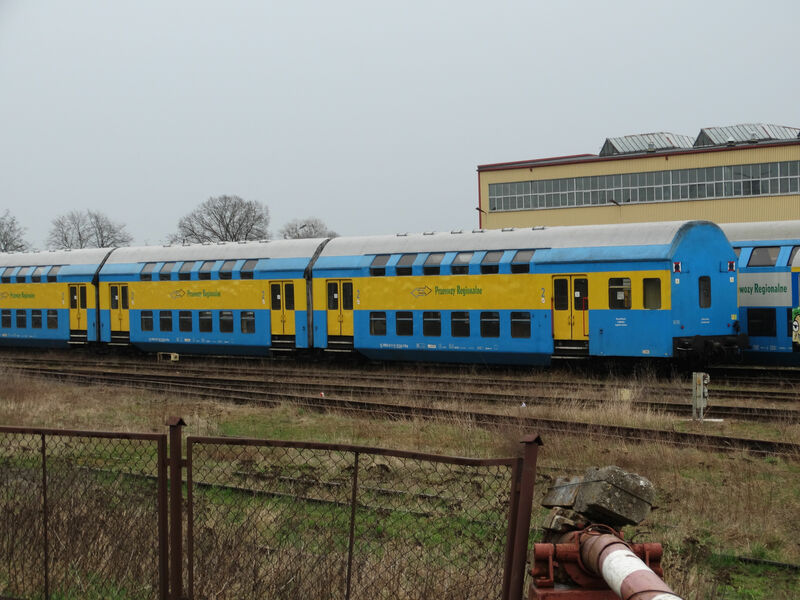 And when the Lint trains finally arrived and the old MRDs became obsolete, at least this one has ended up in Poland, running here for the Kuyavian-Pomeranian province train services, in this case on the line Chojnice-Bydgoszcz. Compare with the same trains shown in this train pictures archive under "Denmark". Picture in Chojnice 5.4.2017 by Ilkka Siissalo. A two coach railbus of the Pesa made class SA133 of the Województwa Małopolskiego, the regional train company of the province of greater Poland (Malopolskie), seen here at Krakow main station ready to leave towards Krakow airport. Picture at Krakow Glowny 7.7.2007 by Ilkka Siissalo. 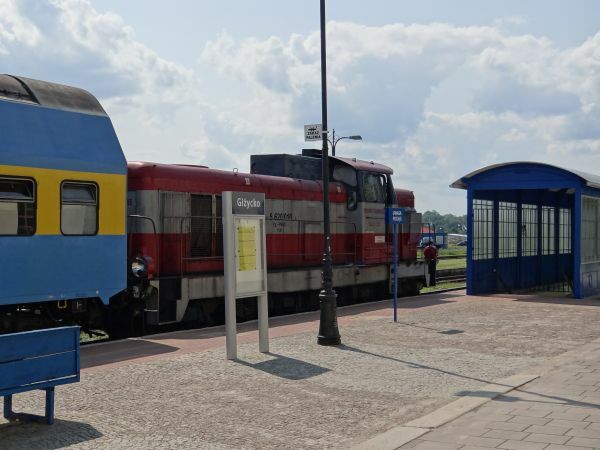 A two coach railbus of the class SA133 is waiting at the station of Suwalki in eastern Poland for its time to leave towards Bialystok. 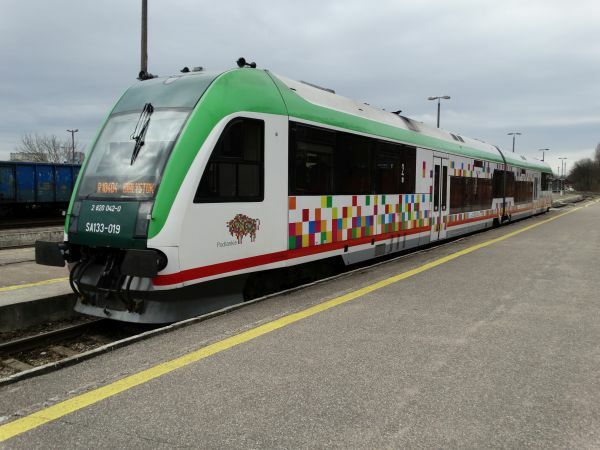 The train is in the colours of Województwo podlaskie, the province of Podlasie, but the operator is Polish state railways PKP Polregio, former Przewozy Regionalne, which is the regional trains division of PKP. Picture in Suwalki 3.4.2017 by Ilkka Siissalo. The same SA133 as above. Picture in Suwalki 3.4.2017 by Ilkka Siissalo. 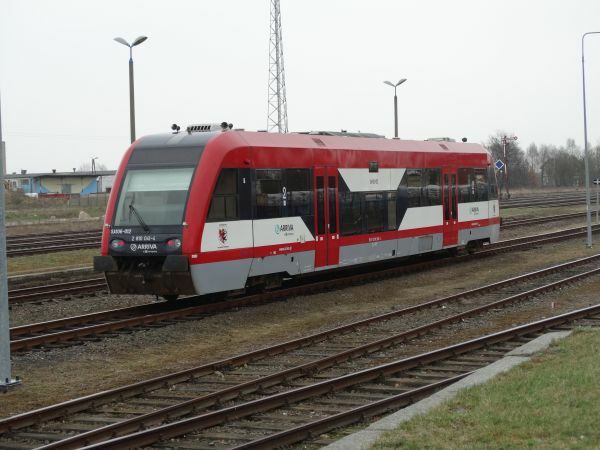 A class SA138 railbus built by Newag and operated by SKM on behalf of the province of Pomorsk or previous German Pommern. Picture at Gdansk glowny (main station) 4.4.2017 by Ilkka Siissalo. The same SA138 as above. Picture at Gdansk glowny (main station) 4.4.2017 by Ilkka Siissalo. 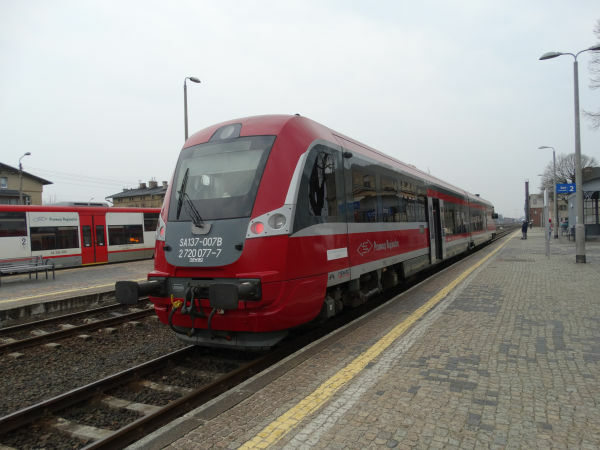 Another SA138 in Gdansk. The type is Newag's model 220M (two coaches) or 221M (three coaches like here). 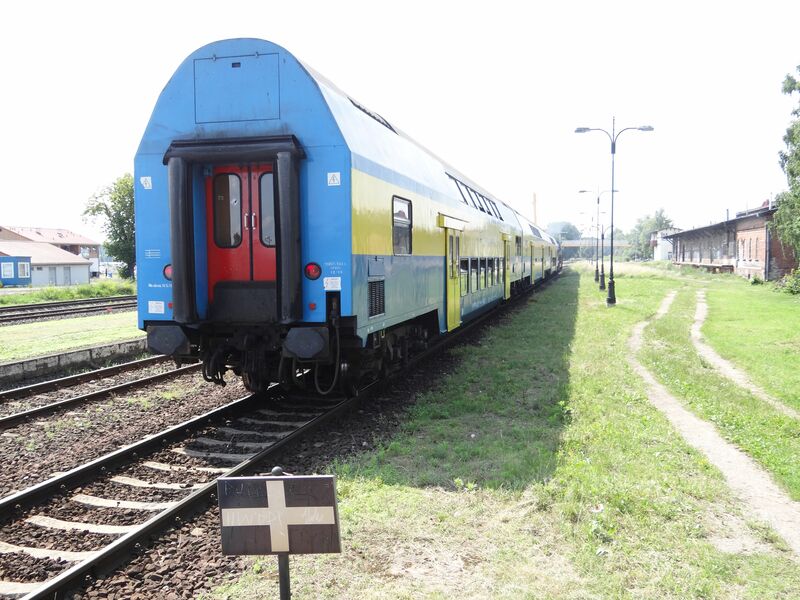 It's still a fairly rare train: only 14 have been built for five Polish customers. Picture from Gdansk main station 27.12.2017 by Timo Varshukov. This is an SA136 diesel multiple unit of Polregio with the tapings "Pomorskie" to advertise its use in the province of Pommern. 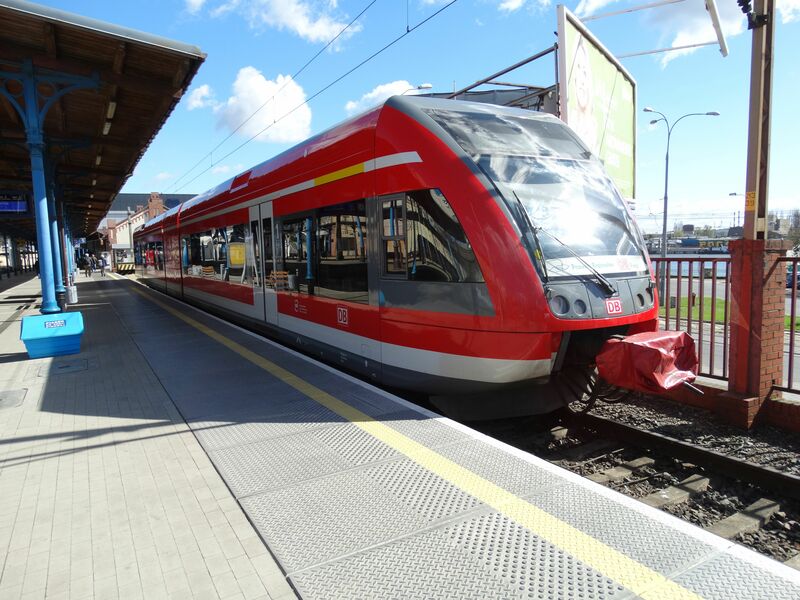 The SA136 is built by Pesa and Pesa calls it Pesa Atribo. 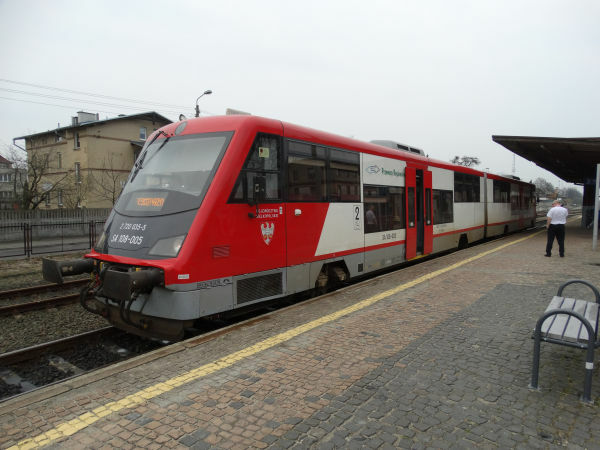 These trains are used not only in Poland but also for example in Italy. Picture from Gdansk station 27.12.2017 by Timo Varshukov. 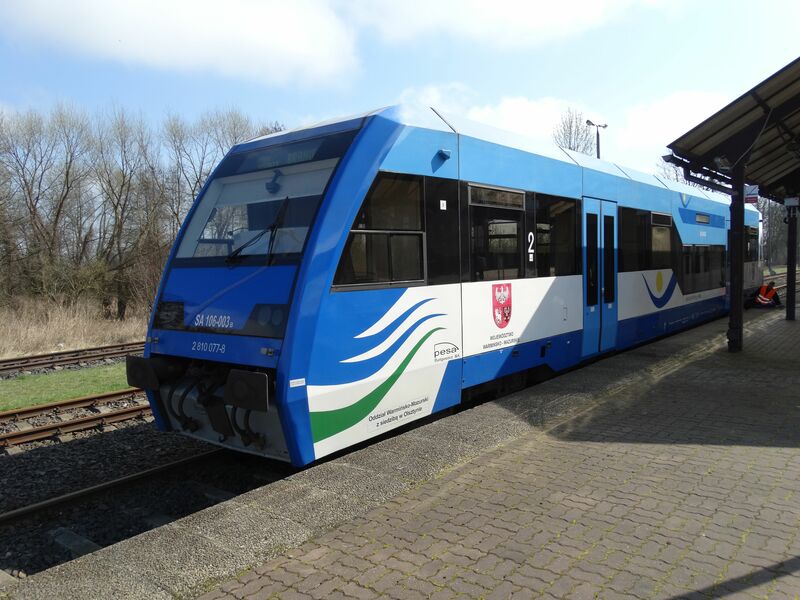 A modern railbus of the class SA106 built by Pesa, here waiting at the Braniewo station. 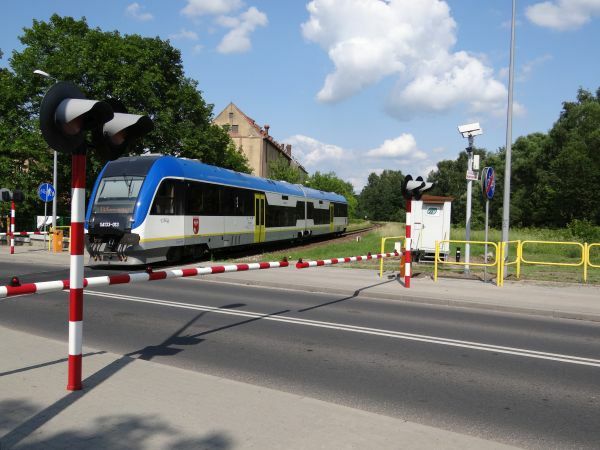 Braniewo is the gauge change station at the border between Poland and the Russian enclave of Kaliningrad (ex. Königsberg). 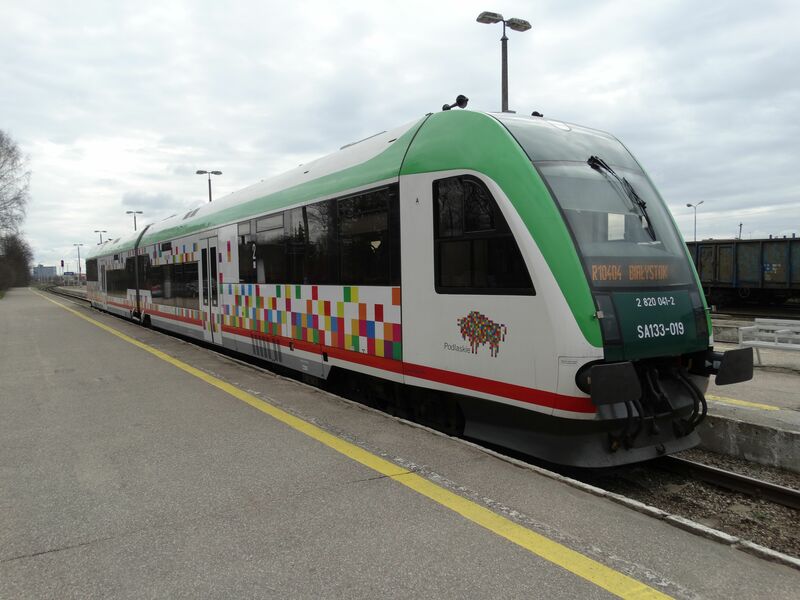 The train is in the colours of the province, but the operator is the old state railways PKP Polregio. Picture in Braniewo 4.4.2017 by Ilkka Siissalo. Same SA106 as above, but seen from the front. The train driver seemed to have a problem with closing one of the doors. Picture in Braniewo 4.4.2017 by Ilkka Siissalo. 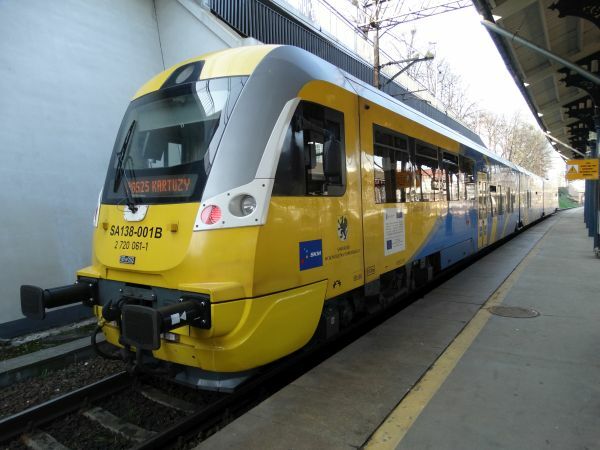 An SA133 railbus made by Pesa, here in the colours of the Warmia-Masuria province, but operated by the state owned Polregio. Picture is from the very small train stop of Niegocin 29.6.2013 by Ilkka Siissalo. 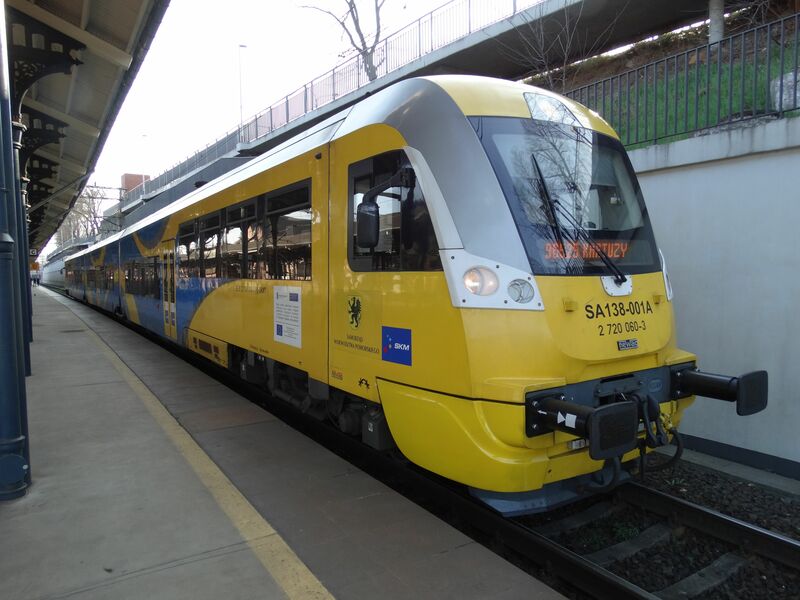 The same SA133 railbus as in the picture above, here stopping at Niegocin on its way to Elk. Picture 29.6.2013 by Ilkka Siissalo. The SA133 railbus by Pesa is a nice and modern train. Picture 29.6.2013 at Niegocin by Ilkka Siissalo. The class SA108 is a peculiar looking low-floor, two-coach diesel railbus with just two axles per coach. 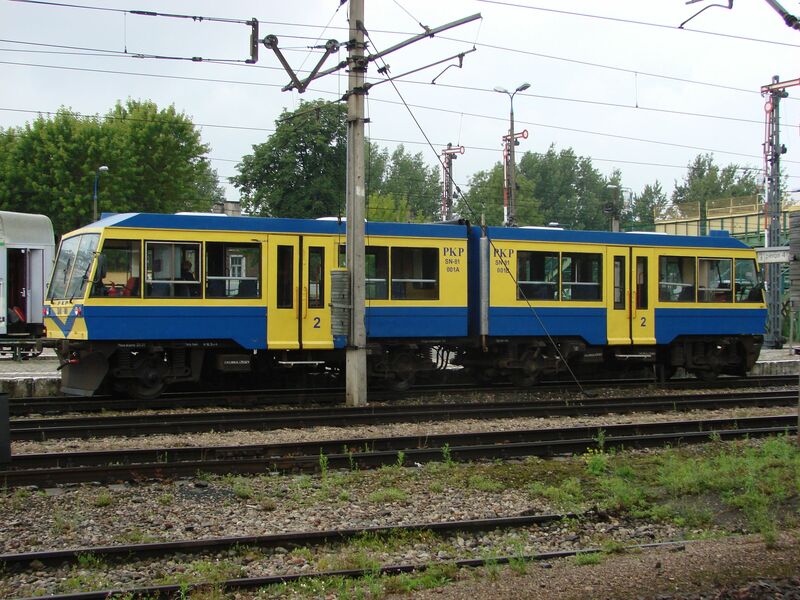 It is a diesel multiple unit built by ZNTK Poznan as their type 215M. The builder gave it the name "Regio Tramp". One coach Regio Tramps are of the class SA105 and two coach variants are SA108. These were built as the successors of the types Kolzam SPA-66 and SA101 shown also on this same page. Only 10 trains of the class SA108 and seven of SA105 were built. Picture at Chojnice station 5.4.2017 by Ilkka Siissalo. The same SA108 Regio Tramp seen from the front. Picture at Chojnice station 5.4.2017 by Ilkka Siissalo. 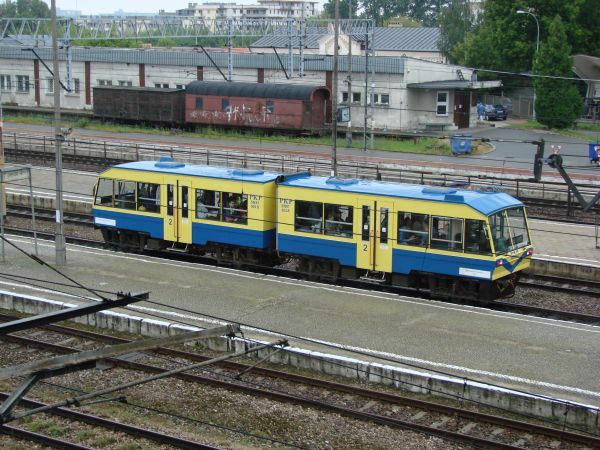 Two class SA103 railbuses made by the company Pesa, here operating for the trains of Western Pomerania. Picture from Szczecin glowny 6.4.2017 by Ilkka Siissalo. 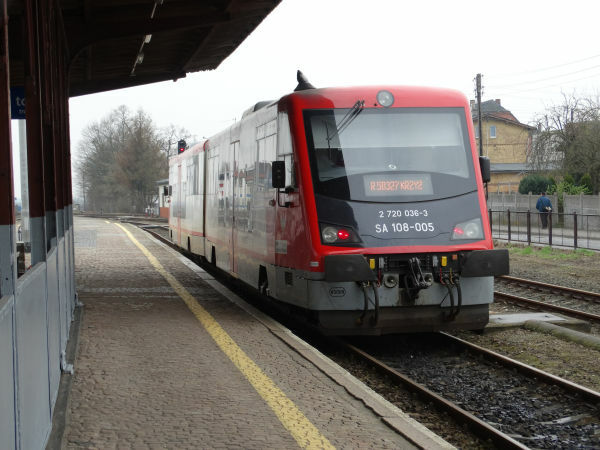 A Polregio SA137 railbus arriving to Chojnice. It is a brand new model, Newag's model 220M, built since 2011. Picture 5.4.2017 by Ilkka Siissalo. Another picture of the same Polregio SA137, here at the Chojnice station. Picture 5.4.2017 by Ilkka Siissalo. The SA104 was a very odd diesel railbus. It was built by Kolzam as their type 208M. It had two very short, coupled coaches and only two axles per coach. It was used on very poor quality side lines which would not tolerate heavy locomotives. This one, here spoiled by graffiti is now at the scrapyard in Chojnice. This one was the SA104 no.001. 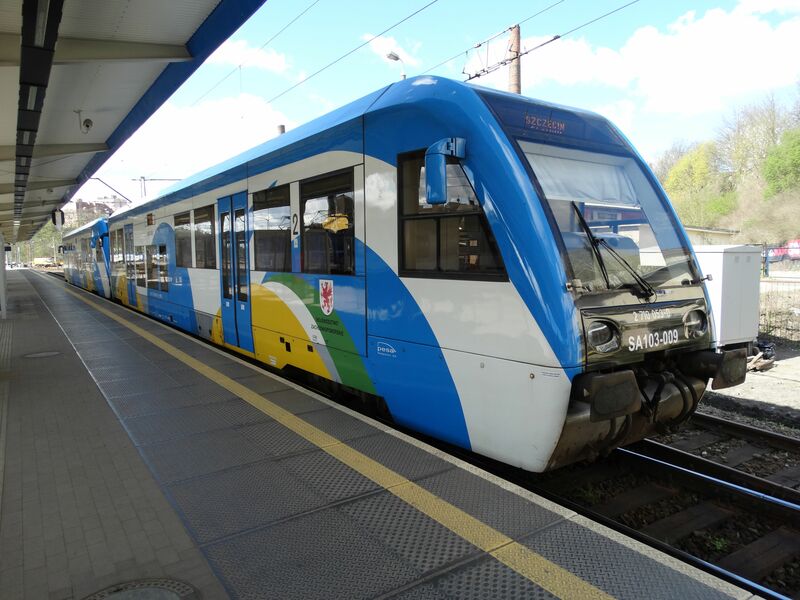 It was used on the Koscierzyna - Chojnice as well as Koscierzyna - Gdynia routes at least until 2011. Picture at the Chojnice scrapyard 5.4.2017 by Ilkka Siissalo. This one looks like the same train as the SA104 pictured above, but it is not, it's just a close relative. 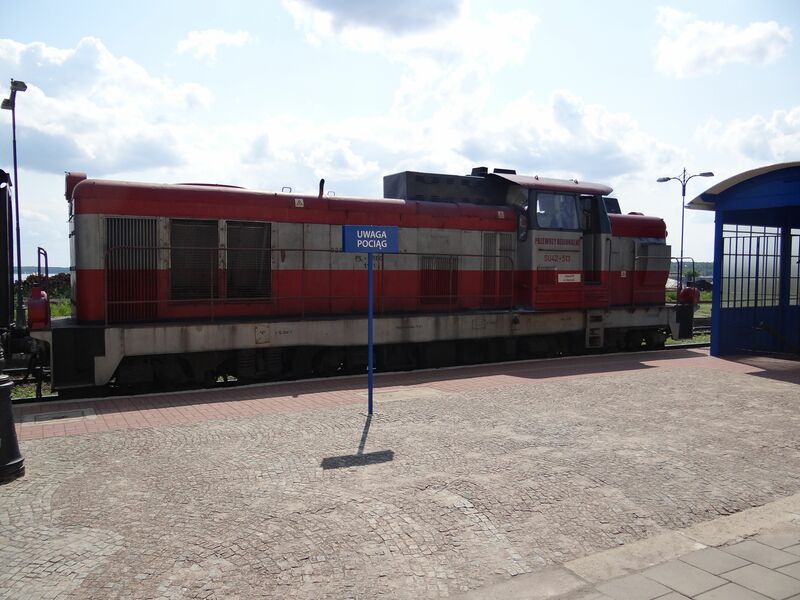 This was PKP's SN81 no.003 in 2007 in Bialystok. Also this train was built by Kolzam in Racibórz as the type Kolzam SPA-66. They were built 1988-1990 to lower costs of train travel and to better compete with buses. In many cases these machines replaced old steam locomotives. 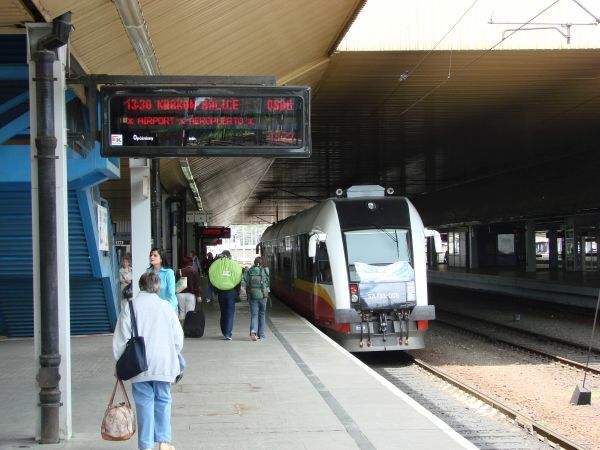 Picture from Bialystok station 5.7.2007 by Ilkka Siissalo. The same SN81 as in the picture above. Picture from Bialystok station 5.7.2007 by Ilkka Siissalo. 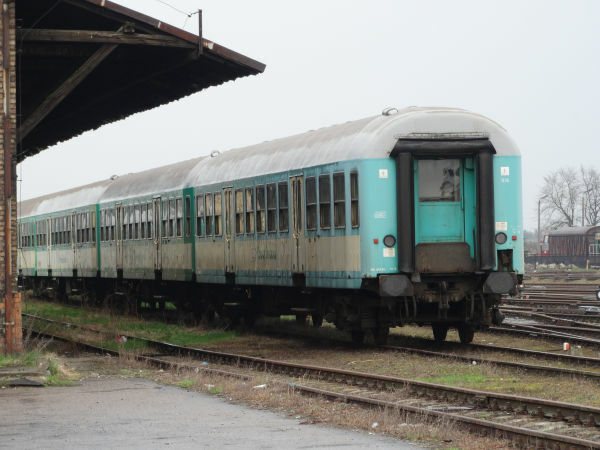 The SA101/SA121 pair used to be a two coach diesel multiple unit with just two axles per coach. It was the model 207M by ZNTK Poznan. Only three trains were made in or since 1990 and they were used in suburban traffic. The train had German Deutz diesel engines. 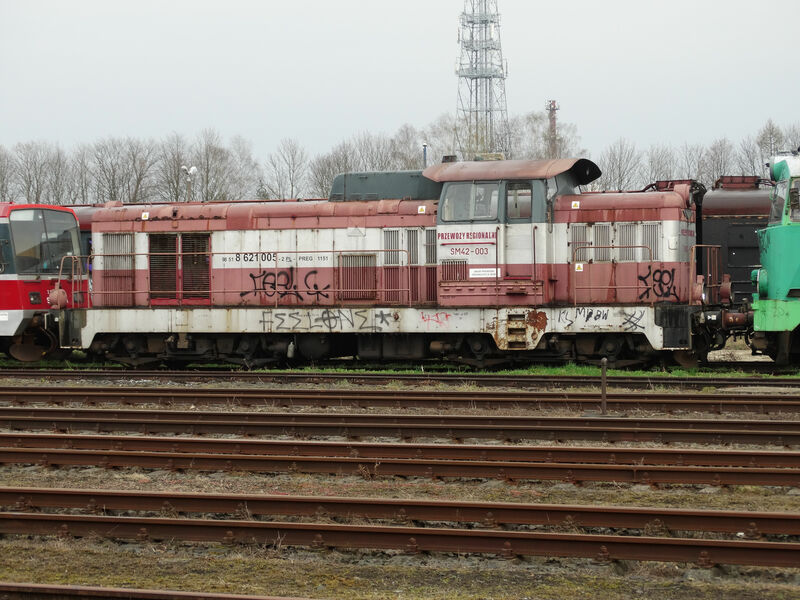 Two out of the three made ended up at the scrapyard at Chojnice, where vandals sprayed them with ugly graffities and where Ilkka Siissalo took this picture 5.4.2017. 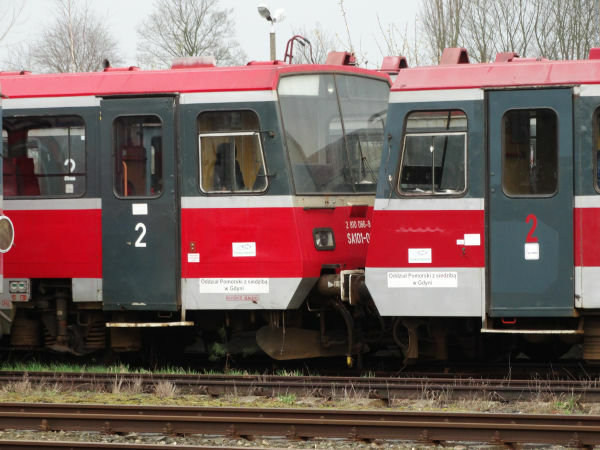 Drivers cabs of two SA101/SA121 units. 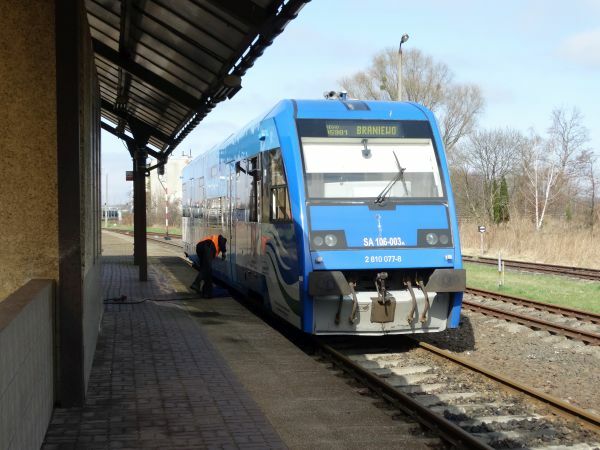 The texts reveal that the trains had been used in the area around Gdynia in suburban traffic. Picture in Chojnice 5.4.2017 by Ilkka Siissalo. 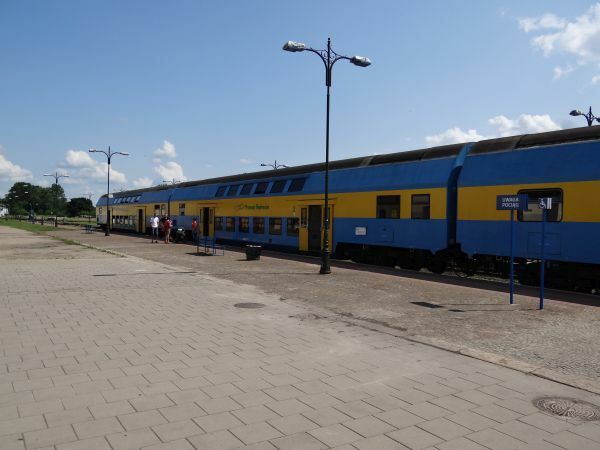 Polregio (former Przewozy regionalne) still uses some of the old SM42/SU42 locomotives together with old DDR-made double decker coaches or coaches which resemble old German so called Silberling coaches, but this kind of trains are becoming rare. 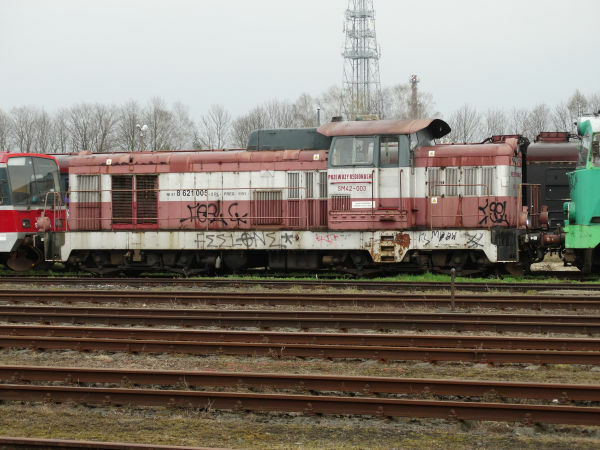 This SM42 had ended up at the scrapyard at Chojnice. Picture 5.4.2017 by Ilkka Siissalo. This kind of coaches were/are typically pulled by Polregio's SM42 or SU42 (or SU45) locomotives in regional traffic whenever there still are locomotive pulled trains. The coaches are very similar to Germany's so called Silberling coaches, but they were made in Poland. Picture in Chojnice 5.4.2017 by Ilkka Siissalo. This kind of doubledecker coaches are still also commonly used by Polregio / Przewozy regionalne together with SM42/SU42 diesels. They were made during communist times in what then was DDR and they were exported to many socialist countries. But today it's difficult to find them anymore anywhere else except in Poland. Picture in Chojnice 5.4.2017 by Ilkka Siissalo. Similar East German communist time doubledecker coaches as in the picture above, here still in use in Northern Poland. 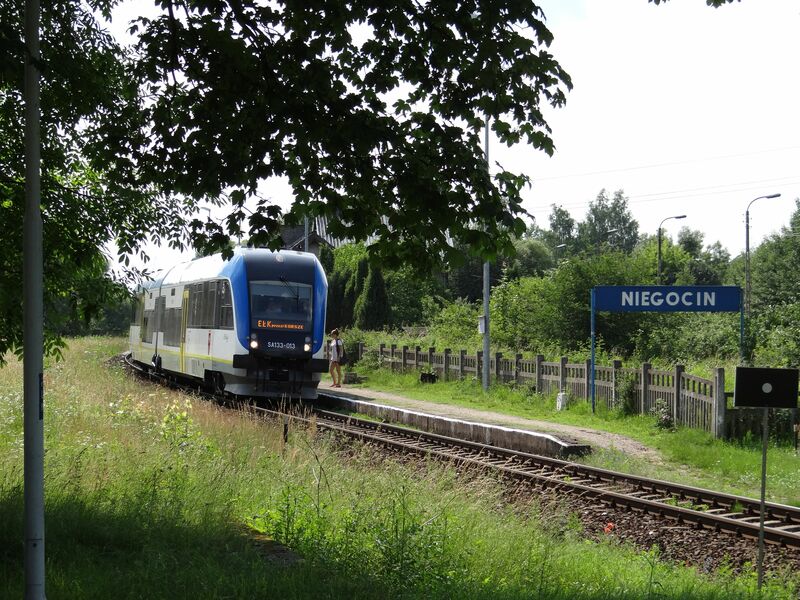 Picture from Gizycko station 29.6.2013 by Ilkka Siissalo. Same train as in the picture above. The locomotive is an old class SU42 machine. They were built by Fablok 1967-72 and they are still quite common everywhere in Poland. The SU42s are already quite rusty and smokey machines. The SU42s have had over the years many nicknames, for example Zebra (because of the painting), Wibrator (because the trembling and rattling noise) and Polsat (from livery similar to one popular TV operators' colours in Poland). There it goes, leaving a thick cloud of smoke behind. This is pure "ostalgy", nostalgy for the old communist times. 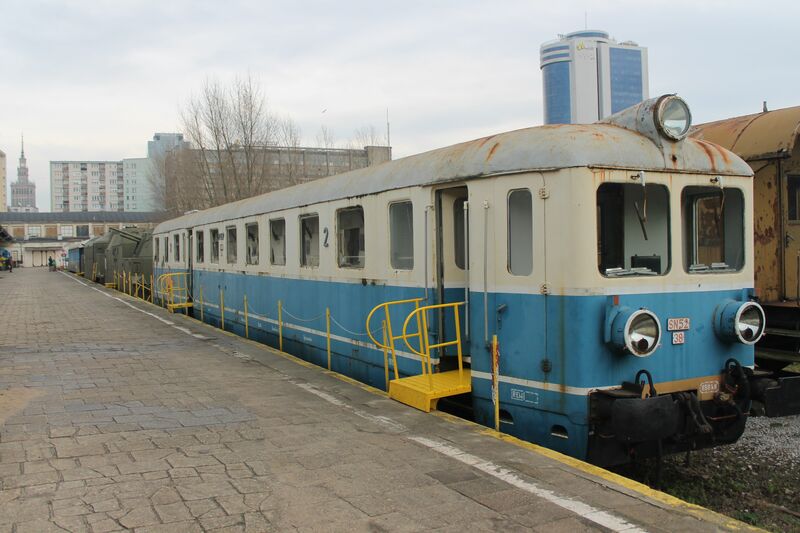 This poor old railbus used to be of the state railways PKP's class SN52. The company Ganz of Hungary built for Poland 50 of these machines after the second world war in 1954-55. The last ones were taken out of use in 1886. 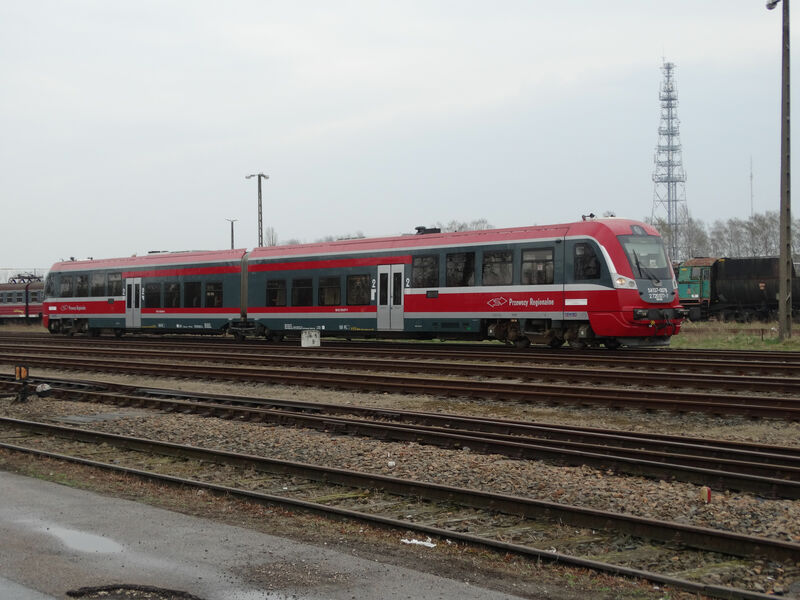 The German DB and Polregio have once again started in cooperation to run direct regional trains between Berlin and the former German city Stettin. During cold war times this would have been absolutely impossible. 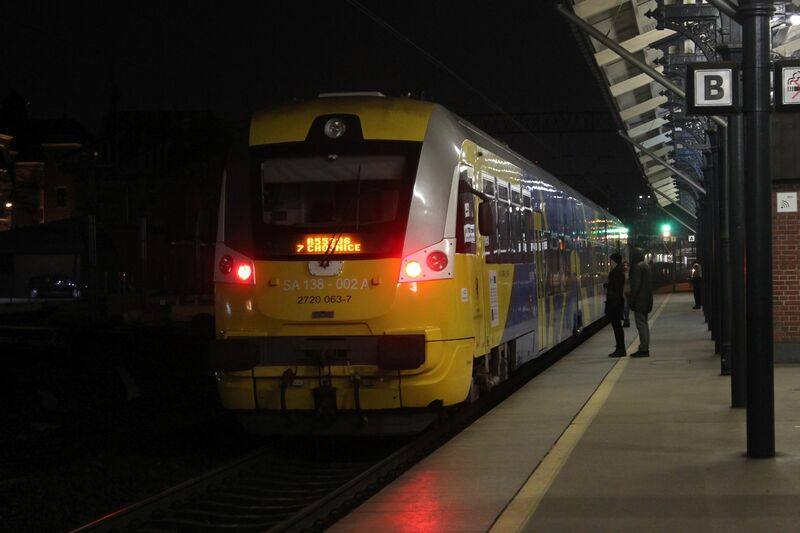 This is a DB class 646 (Baureihe 646) Stadler GTW 2/6 railbus at Szczecin glowny, Stettin main station, waiting for its departure time towards Berlin Lichtenberg. Picture 6.4.2017 by Ilkka Siissalo.